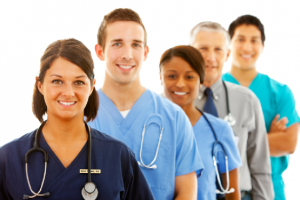 Become Career » What are Different Types of Medical Careers? If you have an interest in working in healthcare, you may be exploring different types of medical careers. You may also be discovering that the medical field is so wide and diverse that it can be difficult to discern the best direction to take. Depending on your talents and interests, you might end up exploring a career as a health informatic or medical technician, or traditional positions such as doctor, nurse or physician’s assistant. Even those categories don’t exhaust all the possibilities, but they will give you a good place to start your research. While many people associate medical careers with hands-on patient care, there is an important and growing role for health informatics: people who gather and manage the vast amounts of data that now go into the health care delivery system. Hospitals, clinics and laboratories use computers to gather and maintain all sorts of data on patients, community health factors and disease. Medical coders and billers also provide an important support role in the health care system. If you’re comfortable with computers or have skills in information technology and an interest in using those skills to help people gain access to good care, health informatics may be a good career choice. Medical technicians are also in demand. This involves more direct patient care in a certain field, where you are trained to perform a certain diagnostic test or to handle certain tasks in a very specific setting. Some examples include diagnostic sonographers, nuclear medicine technologists or emergency medical technicians. When you hear the words “medical career,” you probably think first of doctors and nurses. These jobs are always in high demand, along with the jobs of nurse practitioners and physician’s assistants. While you can become a registered nurse with a limited amount of schooling, many nurses these days go on to complete at least a bachelor’s degree. Nurse practitioners and other advanced practice nurses, such as nurse midwives, nurse anesthesiologists and clinical nurse specialists usually complete at least a master’s degree and sometimes a doctorate. If you’re interested in nursing but aren’t sure if the career is right for you, you might want to try working as a home health aide first. The work of physician assistants is growing in popularity, especially since there is sometimes a shortage of qualified physicians. You can generally become a PA by studying from two to six years, depending on the program. While a PA doesn’t have as wide a scope of practice as a physician, there is still much that they can do under a doctor’s supervision, and PA salaries tend to be high. These are just a handful of medical careers you could explore, according to Explore Health Careers. Others include dentistry and dental hygiene, forensic medicine, veterinarian medicine, dietician work, pharmacy, medical research and physical therapy. And of course, if you decide to study to become a nurse, physician’s assistant or medical doctor, there are many areas of specialization within all of those traditional fields, including family health, public health, gerontology, oncology, cardiology and more. It may feel overwhelming, but if you have an interest in medicine, there’s almost certain to be a good fit for you among the different types of medical careers.